Many children with cerebral palsy exhibit what is known as a “crouch gait,” a walking style that involves an unusually great deal of bending of the hip, knee, or ankle joints. This makes walking difficult and often exhausting, effectively limiting the activities that a child can participate in. At Columbia University a new robotic system has been developed that assists kids with crouch gait in improving their muscle coordination and strength. The technology works by honing the strength of soleus extensor muscles that run along the lower half of the lower extremities, and which are responsible for keeping the knee from bending too much as the foot pushes against the ground. This is done using the Tethered Pelvic Assist Device (TPAD) developed at Columbia that can both safely support the user and to also apply forces on the pelvis to pull it in specific directions with a great deal of precision. Because the soleus muscles get stronger after having to support more weight on the pelvis, the hope was that this approach would lead to an improved gait. 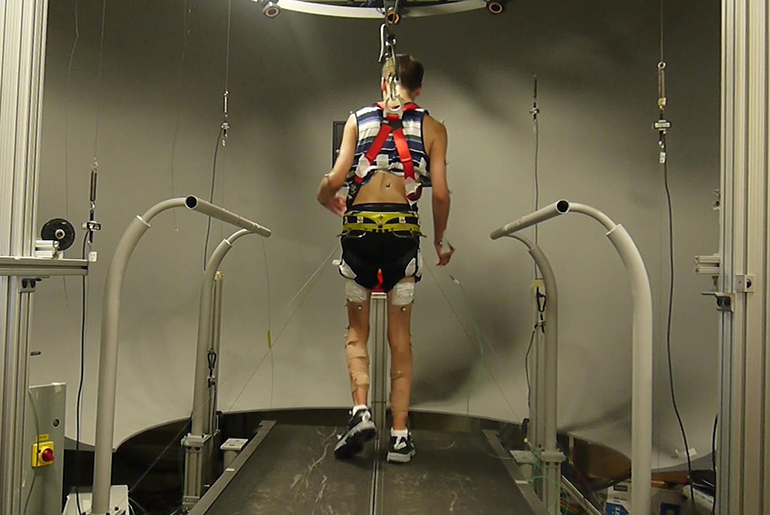 In a pilot study published in journal Science Robotics, the Columbia team reports how six children trained during fifteen 16-minute sessions in a month-and-a-half trial demonstrated increased strengh of their soleus muscles, an improved and more upright gait, and a more coordinated walking style that is closer to an ideal.